Chevrolet enlisted the expertise of prominent data scientist Randy Olson to help families make the most of their spring road trip plans. 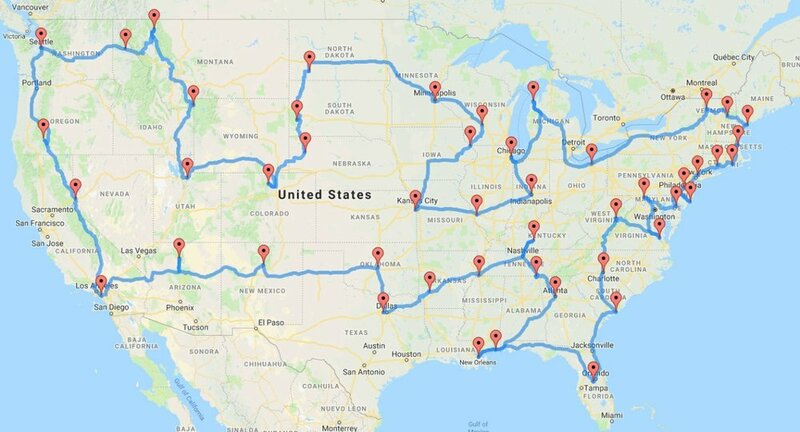 Olson created a map using a custom algorithm to plan an efficient route through all 48 contiguous states, with stops at 48 of some of the best-known and most beloved family vacation spots across the United States. According to a recent national survey commissioned by Chevrolet, spending time with family and exploring new and interesting locations were U.S. parents’ top two favorite aspects of family road trips. From national landmarks to thrilling theme parks and everything in between, this data-driven map provides an efficient route between destinations with the least amount of backtracking and stress — an important consideration for traveling families. To traverse the entire 48-state route, travelers would spend more than 214.56 hours (approximately 9 days) on the road and log 13,389 miles on the odometer — not including time or mileage for overnight breaks and detours. Chevrolet earned J.D. Power Dependability Awards for Most Dependable Compact SUV, Midsize SUV, Large Light Duty Pickup and Midsize Car. The national survey commissioned by Chevrolet also found that parents typically bring an average of 6.6 mobile devices in the vehicle on family road trips. Technology offered in vehicles such as the all-new Chevrolet Traverse, Equinox and Trax can help keep travelers entertained and connected with available 4G LTE Wi-Fi2, built-in navigation and Apple CarPlay3 and Android Auto4 compatibility. Chevrolet also worked with Olson to curate shorter road trips for families looking to explore different parts of the country in-depth, including the Midwest, the Northeast, the West Coast, Texas and Florida. In the spirit of Find New Roads, Chevrolet wishes everyone a safe and happy road trip season. 1Requires a compatible mobile device, active OnStar service and data plan. 4G LTE service available in select markets. Visit onstar.com for coverage map, details and system limitations. Data plans provided by AT&T. 2The Chevrolet Equinox, Chevrolet Traverse, Chevrolet Silverado and Chevrolet Malibu received the lowest number of problems per 100 vehicles in their respective segments in the J.D. Power 2018 U.S. Vehicle Dependability Study, based on 36,896 total responses, measuring problems experienced during the past 12 months by original owners, surveyed October-December 2017. Your experiences may vary. Visit jdpower.com/cars. 3Vehicle user interface is a product of Apple and its terms and privacy statements apply. Requires compatible iPhone and data plan rates apply. Apple CarPlay is a trademark of Apple Inc. iPhone is a trademark of Apple Inc., registered in the U.S. and other countries. 4Vehicle user interface is a product of Google and its terms and privacy statements apply. Requires the Android Auto app on Google Play and an Android compatible smartphone running Android 5.0 Lollipop or higher and data plan rates apply. Android, Android Auto, Google, Google Play and other marks are trademarks of Google Inc.
5Read the vehicle’s owner’s manual for important safety or driver assistance feature limitations and information. 6Does not detect people or items. Always check rear seat before exiting.